Seveneves was a lot in many ways, and I came out of it just wanting something easy and entertaining; the Artemis Fowl trailer dropped over the holidays, so it was a natural pick. I remembered enjoying the story when I read the first book a very long time ago, and I figured I’d give it another go round to see how it had held up. Sometimes after a lot of broccoli, you just want a handful of popcorn. 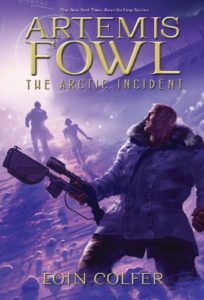 The series by Eoin Colfer follows the exploits and escapades of Artemis Fowl, a child genius (12 at the time of the first book) with minimal parental supervision who uses his wits and copious free time for criminal pursuits. This consistently puts him at odds with the fairy realm, which has retreated to its technologically advanced metropolises underground to avoid dealing with the spread of humanity. And by technologically advanced, I mean the leprechauns have guns and mind-wiping devices and a hacker/inventor centaur. 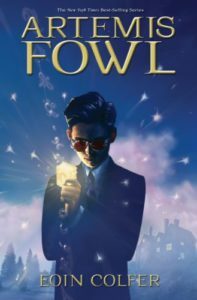 The first book, Artemis Fowl, sees the eponymous protagonist embark on a plan to discover the fairy world, kidnap one of its members, and hold them for ransom to restore his family fortunes. He enlists the help of his loyal bodyguard/servant/only friend Butler to provide brawn to go with his brains, and off they go. Of course, succeeding also means having to face down magical SWAT teams and other enchantment-tech hybrids, all making for a decent romp, even if the twists aren’t quite as complex as they think they are. The second volume, The Arctic Incident, balances dual peril: Artemis and crew are enlisted to aid in putting down a goblin uprising underground while also searching a frozen nuclear wasteland for Artemis’s kidnapped father. 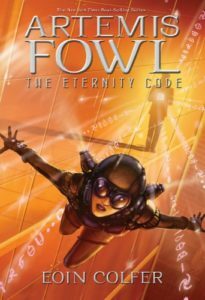 The Eternity Code comes next, going hacker heist after Artemis’s experiments with fusing human and fairy technology fall into the wrong hands. It’s a fun blending of genres, and the play of magic and its limitations paired with computers and spy cameras can be intriguing. The downside, unfortunately, is that the writing is…not good. The stories are easy to follow, but that’s about the best I can say for it. I remember publishers pushing the books as the next Harry Potter, but they aren’t even on the same level. Where Harry and friends took me on adventures from middle school to university, Artemis lands squarely in the domain of late elementary to middle school. No character ever rises about a cut-and-paste archetype in the most hamfisted style possible. For the most part, everyone gets basically one defining characteristic, usually the most cartoonish one available. Butler’s younger sister, Juliet, is Not Like Other Girls and is obsessed with professional wrestling and is too impatient to use common sense. Commander Root of the fairy world police force is apoplectically angry all the time except when narratively convenient. Even Artemis Fowl himself, with all his protagonist pagetime, is an insufferably snotty “boy genius” with very little to make him genuinely sympathetic. Perhaps it is because the worst of the contrived twists circle around him, but his displays of so-called genius grew increasingly irritating as the stories wore on. And I read three of them! For works that have such creative premises and obviously some thought into the worldbuilding, it’s a shame that so much of it just feels so lazy. Fleshed out, it could have been fascinating and even challenging, exploring how a culture that values nature and magic approach technology and social hierarchy differently from ours. It could have looked more inquiringly at ideas of honor, family, and what it means to owe a debt to someone you don’t particularly like. Precocious 12-year-olds will probably love it because it does neatly capture a world framed exactly how precocious 12-year-olds think it works, but like most of my ideas about life at that age, it just doesn’t hold up now. Share the post "Honey don’t"